On October 17th, 2016, Virginia Dueño Ortíz passed away peacefully in her sleep. She was 92 years old. The second of four children, Virginia was born in Cayey, Puerto Rico and relocated to Diamond Bar, CA in 1977 with her daughter and two granddaughters, and later to Half Moon Bay, a community she loved. Most people called her "Tata" and she spent most of her life devoted to her family assuring that each generation was guaranteed nurturing. Her home was always a place for wonderful Puerto Rican food, where she prepared the family favorites. Her generosity and love extended to all that knew her. 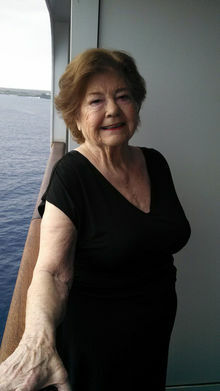 She had a great sense of humor and loved gardening, water aerobics and shopping. She is survived by her daughter, Virginia Perry, granddaughters, Ivette and Vivian, her great granddaughter, Lauren and her son-in-laws, Len, Dean and Mark and her dog Baylee. "We loved her in life, will miss her terribly and will carry her in our hearts always." A celebration of her life will be held privately at the family request. If you would care to make a donation in her memory, you may consider a donation to the Leukemia, Lymphoma Society at https://donate.lls.org/lls/donate or 888-557-7177.